Last Friday was Crossover Day at the Georgia Legislature, which means no new bills will be introduced this legislative session. Not only will no new bills be introduced, but those bills that didn’t pass either the Senate or the House are effectively dead; they can no longer progress out of one chamber and crossover to the opposing chamber. So we’re left with what we’ve got. Unfortunately, and as it usually goes, we could have gotten a whole lot more. This the seventh installment (this one covers both the seventh and eighth weeks) of a weekly segment looking at the bills being introduced in the Georgia Assembly that involve land use, environmental, and transportation issues. Please see the 2015 Legislative Session page for ongoing coverage. 4.) Transit Authorities for Everyone! So what we are left with is some watered-down environmental and land use bills, a bunch of new cities, and a looming transportation battle that’s sure to end in disappointment. Let’s start with the environmental and land use bills. What could have been a huge victory for good urban land use policy, turned out to be more of the same anti-urban mentality from the legislature. In the closing hour or so of the day, the house passed HB-174, an amendment to the Urban Redevelopment Law (URL). The URL lays out the legal framework for how local governments go about redeveloping rundown areas. Included in this law is how governments can use the power of eminent domain to acquire property in the pursuit of revitalization. While the United States Supreme Court has upheld fairly expansive uses of eminent domain under the US Constitution, Georgia and many other states have placed limitations on the government’s power to take private property. The Urban Redevelopment Law has always been a work of such limitations. It attempts to finely craft how and when governments can take blighted property in the name of public use and economic development. Local governments can exercise eminent domain over properties deemed to be in blighted areas once the governing body has declared the area to be an area of blight and an urban redevelopment plan is created. As introduced, HB-174 attempted to do two things: 1.) update the language in the URL to start referring to areas as “pockets of blight” instead of “slum areas;” and 2.) add several new ways in which acquired property can be utilized. Sadly, it only succeeded in its first attempt. The bill would have allowed local governments to acquire blighted property to decrease or increase density and to build streets, utilities, parks, playgrounds and transit facilities, bike trails, streetscapes, and sidewalks. Alas, the House Transportation Committee struck the added italicized language, thereby maintaining the antiquated belief that more density is never the solution and that bike trails and sidewalks have no impact on the desirability of an area. I suppose this makes it easier for governments to take property to build large, auto-oriented projects by completely dismissing the ability to use tools (density, sidewalks, transit-facilities, bike trails) that are supportive of pedestrian and community health. 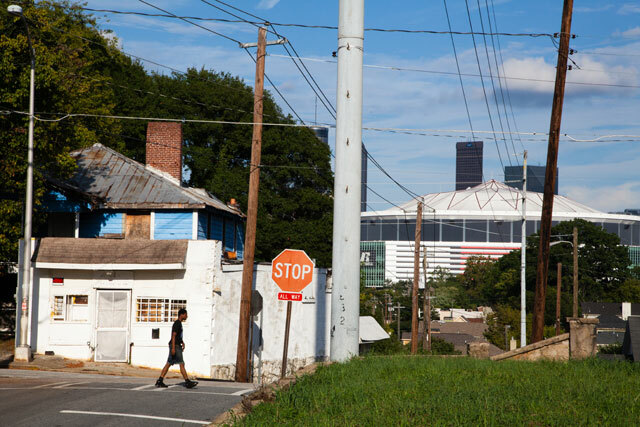 It’s scary to think that Virginia-Highlands, one of the most desirable neighborhoods in Atlanta, was almost razed decades ago in order to build I-485. After years of opposition, a limited version of I-485 was constructed in the form of Freedom Parkway. While the neighborhood was largely spared, the fight shows just how pervasive the policy of “freeways over urban neighborhoods” has been for the past 60 years: even a wealthy neighborhood couldn’t completely combat these policies. It fared much much better than hundreds of neighborhoods across the country. The news is good, though: over the past decade or so we are now seeing a reversal of these policies as cities are tearing down freeways in order to reconnect neighborhoods and take advantage of amazing waterfronts. Though the language buried in the URL seems minor, it maintains the historic policy of catering to roads over communities. The original bill would have done well to correct this and bring the state into the present. Landowners can enter into covenants with taxing authorities restricting the use of the land to conservation uses. This allows the land to be assessed at a lower value. Many stipulations are required and generally if any of them are broken then the covenant is broken and the land no longer gets the benefit of the lower assessment. This bill allows solar panels to be installed on land restricted by such conservation covenants without it being considered a breach of the covenant. The only catch is that the land devoted to power generation is no longer part of the covenant. That land is severed from the other land subject to the covenant and is assessed at fair market value. Along with the solar-financing bill, HB-57, this is the second solar power-themed bill to pass the House. The one major environmental bill that progressed since the Week Six post is SB-36, the bill designed to protect the Floridan Aquifer. The bill sought to prohibit the underground storage of surface water in several coastal Georgia counties. The storage of surface water in aquifers has become increasingly popular in many areas including Florida and Georgia, but more and more evidence shows that this type of storage poses significant threats to the quality of water in aquifers. The mixing of the two waters not only damages the quality of the water in the aquifer, but makes it that much more expensive to extract the aquifer water and purify it to drinking standards. The bill, as introduced, prohibited this type of storage. The House decided to punt on this bill by amending it to leave it up to the Department of Natural Resources to study the issue and come up with regulations designed to protect the integrity of aquifer water. When regulations are created, it’s almost certain we won’t see an outright prohibition. One piece of good news is that the House passed a bill amending 32-9-9 of the Georgia Code, a law that requires metropolitan areas to have at least 43,617 people before the legislature can create a metropolitan transit authority. The bill eliminates the population requirement and allows the legislature to create a Transit Authority for any area it sees fit. Interestingly, the bill is co-sponsored by Jay Roberts, the representative who introduced the Transportation Financing Act of 2015 (TFA). This goes along with his recent statements championing the need for more transit funding. We’ve all heard about the alcohol wars during this legislative session in which the legislature is grappling with nearly century-old rules on sales and distributions. I’ve highlighted the beer bill, SB-63, because I think it could not only have a positive impact on local companies, but it could also be great for neighborhood revitalization. The original bill allowed brewpubs and breweries to sell alcohol to-go, like a convenience store, and also allowed breweries to sell beer for in-store consumption. Breweries basically already do this by selling customers tours, which include samples of the beer. The bill would have nixed this and simply allowed breweries to sell beer like any normal bar. Well surprise, surprise, the legislature amended this bill to make sure nothing really changes. Instead of being allowed to purchase beer from a brewery, SB-63 now only allows you to “purchase” a growler (a large re-usable container) of beer. Purchase is in quotation marks because the bill allows you to purchase a tour and if you pay enough you can then get a growler. The original version would have allowed one 12-pack of beer to be sold, but the updated, passed version only allows for 64 ounces in the growler. By allowing breweries to sell beer just like a convenience store or operate just like a bar you greatly increase the likelihood that people will interact with the brewery for more hours each week. This is an incentive to get breweries to open in downtown or more urban spaces, instead of in industrial zones. Well we ended last week with a bang as the legislature squeezed in several bills either creating new cities or expanding existing ones. Those bills included the annexation of South Fulton by the City of Atlanta (SB-214), the annexation of the Druid Hills area by the City of Atlanta (HB-586), the expansion of the City of Acworth (SB-217), the creation of the City of Greenhaven (SB-221),and the creation of the City of Stonecrest (HB-539). Ultimately, all those bills failed to pass their respective chambers and will no longer be considered during this legislative session. The only bill to have passed both houses so far is HB-329. The rest of the bills are awaiting approval by either the Senate or the House. As expected, SB-217, the bill allowing the City of Atlanta to annex southern Cobb County (where the Braves will soon reside), did not pass the Senate and is now dead. HB-4: Transfer of Water into the Metropolitan North Georgia Water Planning District. This bill is DEAD. It failed to reach a vote in the House. HB-11: Preventing the Boundaries of New Cities from Creating Islands of Unincorporated Areas. This bill is DEAD. It failed to a reach a vote in the House. Current law prohibits creating unincorporated island only when annexing or de-annexing land. The House actually passed a bill, HB-437, that makes the law inapplicable if the de-annexation of land and the subsequent annexation of that same piece of land occur on the same day. HB-21: Abolish a Population Requirement for the Creation of the Transit Systems. This bill was discussed above. It passed 166-1 and now moves to the Senate. HB-116 and SB-36: Prevent the Pumping of Groundwater into the Floridan Aquifer. This bill was discussed above. The Senate version passed 43-3 and now moves to the House. SB-63: Allow Brewpubs and Breweries to Sell Beer On-premises and To-go. This bill was discussed above. It passed 51-5 and now moves to the House. SB-101: Creation of a 25-foot Buffer Along Marshlands. This bill passed the Senate by a vote of 46-4 and is in the House. HB-174: Urban Redevelopment Law. This bill was discussed above. It passed by a vote of 174-0 and now moves to the Senate. SB-139: Prohibit the Banning of Plastic Bags. This bill passed the Senate by a vote of 32-19 and is now in the House. HB-360: Support Required for City Annexation. This bill is DEAD. It failed to reach a vote in the House. HB-318: Membership in Regional Commissions is Optional. This bill is DEAD. It failed to reach a vote in the House. HB-496: Solar Panels on Lands Subject to Covenants. This bill was discussed above. It passed the House by a vote of 165-0 and now moves to the Senate.